How Dangerous is a Black Widow Spider Bite? Black Widows carry potent venom. The potential danger of the black widow spider bite depends on several factors. These include the gender of the spider, the health and age of the individual bitten, and the chance that allergy to spider bites could be present. Caution and emergency medical attention are advised for those who believe they have been bitten by a black widow, but in most cases, the likelihood of continuing illness or death from a bite is extremely minimal. The risk of complications does increase without medical attention. The first qualifier in determining the danger of a black widow spider bite is gender. Female spiders are much more dangerous than males and can inject much higher amounts of venom. Females are about three times as large as males with a body that is round and full in shape, while the smaller male spiders with the hourglass marking have a more prolonged and tube-like body. Examining pictures of the differences on the Internet is a good way to determine if a person has received a male or female bite. The male bite may not cause any symptoms, but if they are present, medical care should be sought. A black widow spider bite is more dangerous to certain people. Very young children and very old or otherwise medically fragile individuals are likely to react more strongly to a bite. Those with high blood pressure are also more at risk. Due to the remote possibility of a fatal reaction in everyone, getting medical help quickly is always advised, but it is especially vital that this caution be observed for those who are most at risk from a bite. Death may also occur simply from getting a spider bite. Some people are allergic to the chemicals in venom, poisonous or not, and can begin to have an anaphylactic shock reaction. This includes symptoms like hives, swelling of the mouth, lips, and tongue, difficulty breathing, asthma, and unconsciousness. Without treatment this reaction can be fatal. People with known allergies to various bug bites may carry epinephrine, and this shot should be delivered immediately. A person should also get emergency help, as they may still suffer from black widow spider bite poisoning. 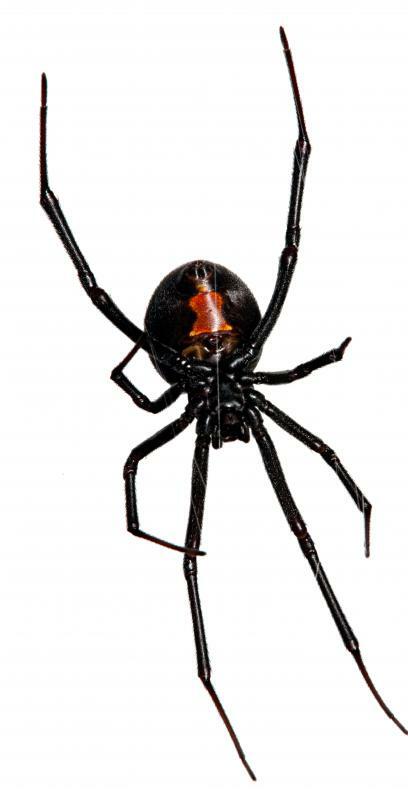 To reduce the dangers associated with getting a black widow spider bite, people should call emergency services if they notice that a bite has occurred. The bite has been described as anything from a pinprick to a sudden painful and stinging sensation. A mark on the skin that has two fang imprints can be another indication, especially when accompanied by pain, redness and swelling at or around the bite mark. Other symptoms can include dizziness, constriction of the chest, sweating, perspiration, a rash or itchy sensations, throwing up, headache, and muscle weakness. Prompt medical attention has the advantage of reducing or eliminating many of these symptoms, just as it significantly lowers fatality rates. What Does "Bite Your Lip" Mean? How Dangerous is a Wolf Spider Bite? What Are the Most Common Symptoms of Spider Bite Reactions? What are the Most Common Spider Bite Symptoms? What Should I Know About Spider Bite Treatment? I always thought black widows were harmless. But when I got bitten, I never thought I was going to live. I went to the hospital and the doctors said "Never be near a black widow." I caught one and studied its poison online. I stared at it a long time and it was a female. I was never going to stop studying it until I found out why it bit me even though I didn't bother it. Then I found out why. The web said,"Black widows are shy and will think that people will bother it, or you are to close to its eggs and it will be fully defensive." You should never assume that you can withstand a black widow spider bite without medical attention. I had a brother who did this, and he got very sick before he sought the help of his doctor. It took him much longer to heal after that delay than it would have taken if he had simply seen his doctor as soon as he knew he had been bitten by the spider.